Semifreddo is Italian and translated means half frozen or semi-cold. This lovely dessert is a cross between regular ice cream and mousse. Excellent dessert to make if you do not have an ice cream machine. Of course, it will be more convenient by machine. In this recipe version, you will find a delicious combination of fresh berries, crispy biscuits and the mousse-like ice cream. Easy and quick to make. Guaranteed to be a success. Serves four pers. Whisk egg foam from egg yolks and 1 tablespoon of sugar. You will strictly speaking not get fluffy egg foam with just the egg yolks, but more like a light soft buttery texture. Pour in the rest of the sugar, cream, lemon juice and cheese. Whisk everything together for about 5 min. Pour into appropriate forms, and freeze for at least 4 hours. Alternatively, you can make it in an ice cream machine and freezer at least 1 hour. There is also an option to serve straight out of the ice machine that is depending on how mousse like you want the semifreddo. 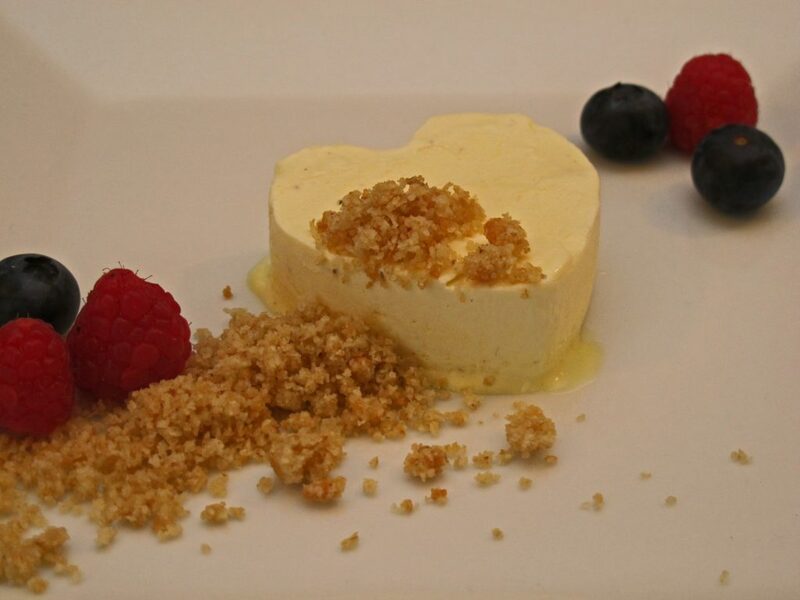 Served: Remove the semifreddo from the forms. Sprinkle with crushed digestive biscuits, garnish further with berries and if desired some lemon balm leaves. Allergy: Not lactose or gluten free. Replacing the cream with lactose-free cream and lactose-free cheese for a lactose-free version. Replace the digestive biscuits with a gluten-free variant or gluten-free oatcake for a gluten-free version. High on FODMAP. Made into low FODMAP content in the same manner as above by making the semifreddo lactose-free and gluten-free.